We live in a time of plentiful books on practical halakhah and it is worthwhile noting when one such book stands out as unique. A few years ago, I pointed out the rarity of inclusive halakhah, of authors quoting authorities from the full spectrum of Orthodox authorities (link). Authors usually quote authorities from within their own orbit and maybe a little to the left and far to the right. I identified three authors, all from Yeshiva University, who have much wider grasps. A recently published book disproves my theory that this is a uniquely YU trait. R. Moishe Dovid Lebovits, a Torah Voda'as alumnus, reaches beyond his comfort zone in his Halachically Speaking volume 2. The book is a collection of essays on extremely relevant halakhos, going into significant detail with multiple views and extensive footnotes. However, unlike many books in this genre, Halachically Speaking does not merely present different views and leave the reader uncertain how to act. He decides (or presents a decision) without negating the other positions. 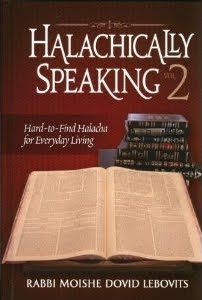 All halachos in this sefer may be relied upon for halachah l'maaseh. However, one who has a question regarding a specific case should follow the age-old practice regarding a specific case should follow the age-old practice of consulting with his halachic authority. R. Lebovits tells the reader that the rulings in the book are reliable but advises people to still ask questions to their rabbis. Without question, the most prominent authority featured in the book is the author's mentor, R. Yisroel Belsky. However, the author searches for relevant rulings in a wide variety of sources, including authorities from the Chasidic, Modern Orthodox and Religious Zionist worlds. Not only are R. Hershel Schachter and R. Yehudah Henkin cited, but my book is quoted as well (p. 111 n. 1). In general, the book is not intended to be innovative. It is, instead, meant to inform readers of little-known laws that they shoud be observing and discuss the varying opinions. The book is meant as a guide to the topics covered, and in that it succeeds. It is well-informed about the reality it discusses and well-aware of the latest halakhic publications. Unlike some compendia, this book does not tend to be strict in order to fulfill all of the views cited. Nor is it overly lenient. The author and the authorities he consults call them like they see them. Sometimes that means being strict and sometimes lenient.